Making ends meet – important in sewing. Recently I have been mostly crouched over my rickety sewing machine trying to create enough stock from things I already have to sell. The already have point is crucial as our cash flow problems are mounting in urgency. The thing is, if your outgoings are always bigger than your income there’s only one direction you’re going to head in. The red. I still have the overdraft I had when I had a salary so we have room but eventually, they’ll want that stuff back and I can’t imagine where it’ll come from. The fine balance between wage and childcare costs mean I need a really well paid job in school hours. Brief pause for hollow laugh. Another drawback being I am qualified for NOTHING. Well nothing well paid anyway. A few years ago I’d of picked up a few night shift at a nearby supermarket or something similar. No childcare costs, I’ve done restocking before and it’s okay and just a little would top up our coffers. Now that seems pretty tricky thanks to the legacy of osteoarthritis my galloping Paget’s left. Sooooo. A few long nights looking at the ceiling considering my skill base has prompted me to look more speculatively at the Etsy and Folksy sites I spend far too long wandering. At the moment it’s only the seed of an idea but a few christmas craft fairs maybe with my very good and far more professionally handy friend Hattie also bolstering the table is actually achievable. 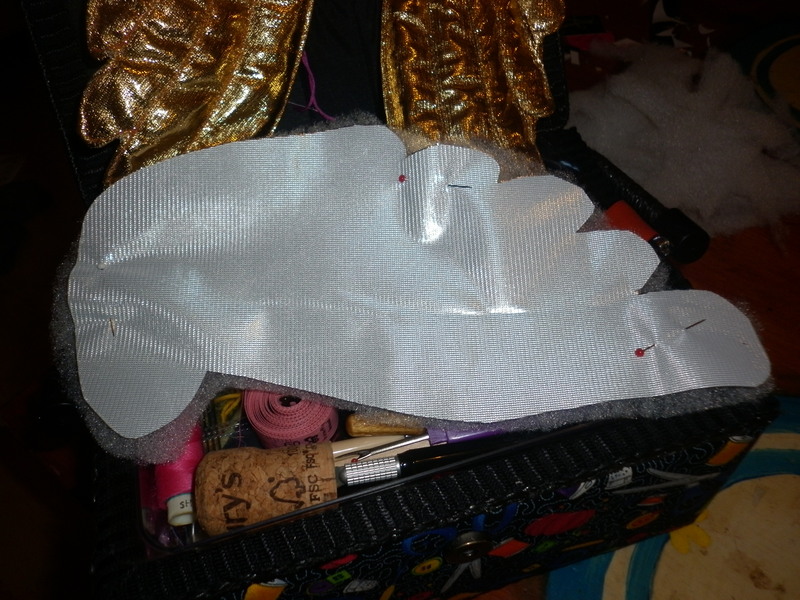 Mooching around assessing my craft stocks I played around with some angel wings I made for Ida for her first Christmas. Things have improved since I sat him down and explained I’m not asking him about his own shopping tastes which don’t run to gold angel wings, hairslides and patchwork bags but seeking reassurance and bolstering. There are lots of beautiful things to see along the way. Some of my favourites are the dark nights which make our home and fairylights seem very safe and cosy. I love frosty mornings and the sky being streaked with pink, orange and red as we brush teeth and scramble into our clothes. I love the smell of quinces in our house and the storing up of jams and jellies. I love Ida’s new enthusiasm for dressing in the morning and her creative approach to wardrobe selections. I love seeing her in her rain gear leaping through puddles. I even love my Dad for miraculously mending her beloved umbrella despite the traumas of being out and about with a truculent toddler armed with what is essentially a collection of spikes. The colder weather perfectly suits the economical soups and stews I concoct from the storecupboard. Silky pearl barley is very soothing and sustaining. Ida is in the full grip of inventive play. We move through the day as crocodiles, aliens, cooks and pirates. As I cook and sew I listen to her narrating exciting games to herself. I am heartened by her happy contented chuntering and offer monster/mummy crocodile/customer/ elaborate meal eater support as needed. I know I am rich in many things although a bit more filthy lucre wouldn’t go amiss. 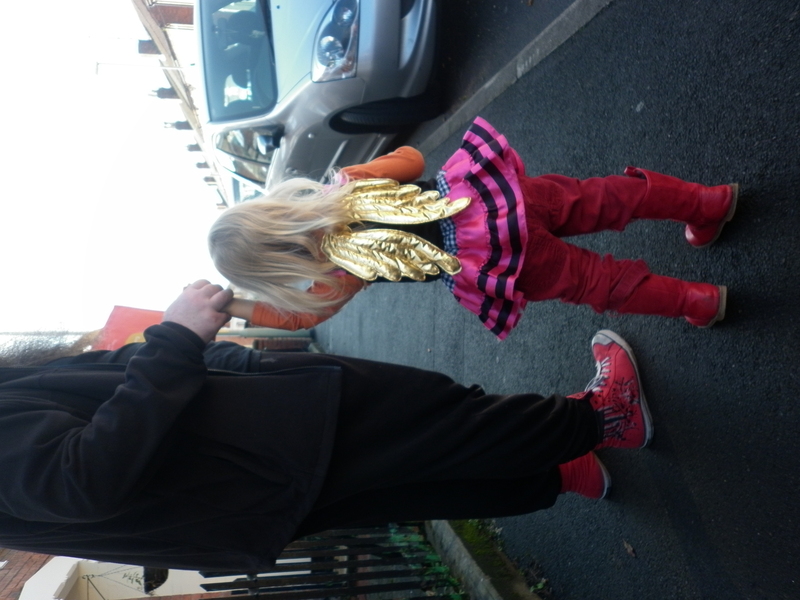 This entry was posted in Uncategorized and tagged angel wings, Beautiful Things, children, craft, patchwork, sewing, toddlers. Bookmark the permalink. Hahaha – the male brain failing to distinguish between “Would people buy this?” and “Would you buy this?” – VERY different questions! You already have an order based on Ida’s modelling alone – Wow, I’m very impressed! 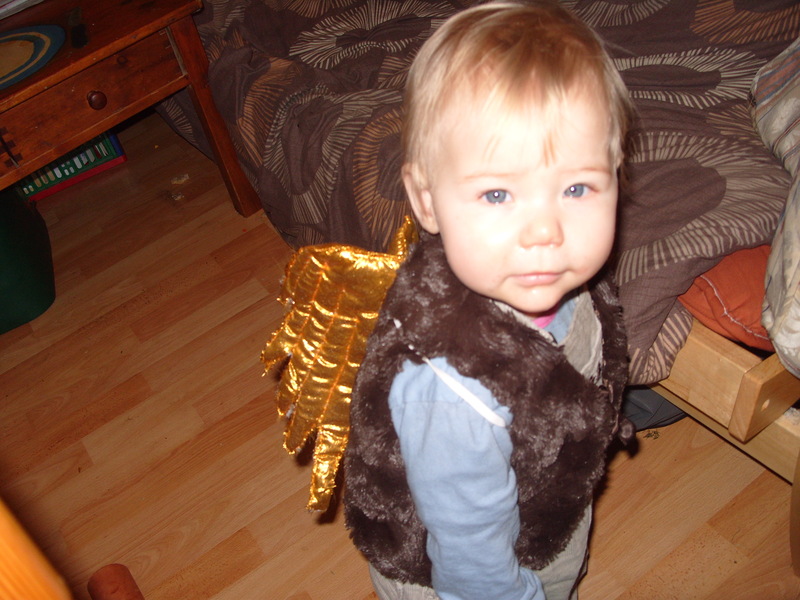 Not that I’m surprised – the wings are very funky – but that’s all the proof you need that there’s a market. Summary – you’re probably better off sticking with craft fairs than online selling. I don’t know how much of that gold fabric you have, but I’d make the whole lot into wings and line yourself up a few Christmas fairs. Thanks for that link Rachel – really interesting. i’m going to facebook message you about something but yes to those wings….how much are you asking? Go for it! Make and sell what you can. I painted in obscurity for seventeen years and this month I had three sales and two bites: I earned over $800 U.S. in one week. It’s thrilling. Keep doing what you do. You can take a job if you have to when the wolf is at the door. Good luck! Just tagged you in a bit of daftness.